Hey folks, Valkor here. In the past few years, comic book fans have been treated with some excellent comic book to animated film translations of some of their favorite characters. Most recently, comic companies have been picking particular storylines to carry over such as Planet Hulk, Batman: Under The Red Hood, or Justice League: New Frontier, which is what they should do since they're the perfect fodder to introduce a comic event unto the main stream masses, who have been missing out. Imagine if Marvel decides to puts out "Age of Apocalypse" or DC with "Blackest Knight"? You'll open up a new world of comic history to an audience who would never pick up a comic, but at the same time, enjoys a good film. Well DC has made the next move by releasing the sequel to Superman/Batman: Public Enemy and bringing you Superman/Batman: Apocalypse. Not as edgy as Red Hood, but still damn good. Comic fans will not be disappointed and newcomers will find it equally enjoyable. 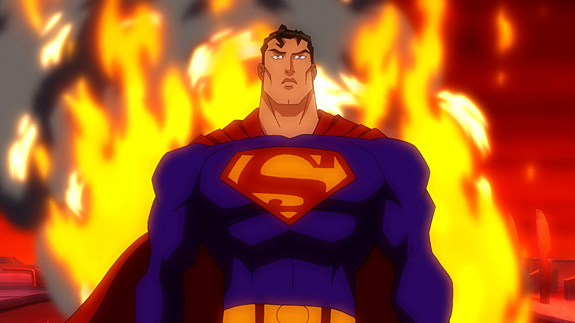 Superman/Batman: Apocalypse continues directly after the events of Public Enemy, after Superman and Batman explode a giant asteroid from crashing into earth. In this latest film, Batman, who was investigating the crash of a strange ship that landed in Gotham waters, (Kevin Conroy) finds a girl, at first of unknown origins, but we soon learn that she is Superman's cousin from Krypton – Kara Zor-El (Summer Glau). Though Superman (Tim Daly) welcomes her with open arms, Batman isn't so trusting. Kara's existence soon reaches the planet Apocalypse where Darkseid (Andre Braugher) now wants the girl to lead his army of Furies. Wonder Woman (Susan Eisenberg) with the help of her sister Amazonians do their best to keep Kara safe, but ultimately Darkseid gets his prize and forces Kara over to the "dark side". And now Superman, Batman, and Wonder Woman with the help of ex-Fury leader Barda literally enter hell to bring Kara back. Specials from the two-disc DVD include "Supergirl: The Last Daughter of Krypton" vintage featurette, which takes a look at the Supergirl character from Silver Age until now, including the character's role in the Smallville series. Next are a couple of episodes hand-picked by Executive Producer Bruce Timm from the Superman Animated Series (Little Girl Lost parts 1 and 2), which is another Supergirl origin story. You'll get a look at the next film in the DC Animated Universe, which will be (as announced ay SDCC) "All Star Superman". And finally the DC comic short: Green Arrow. Enough of that, what did I think of the film? It's a near perfect translation of the popular graphic novel. And I mean just about everything was kept in, with hardly sacrificing much, keep the story intact. I've read the graphic novel, front to back, and I've always enjoyed the hell out of it. But to watch the comic brought to life in animated form is truly a sight to behold. The voice cast of Tim Daly, Kevin Conroy was a no brainer for this film, and there's nothing more of what I can say about these two great voice actors who've given new life to DC's titans. I don't need to tell you they're perfect, if you've seen the series and films then you know what they bring to the table. The voices of Susan Eisenberg and Summer Glau fit perfectly with the Wonder Woman and Supergirl characters, respectively. And I did indeed enjoy the voice of Ed Asner as Granny Goodness, which was completely unexpected but suitable to the character. 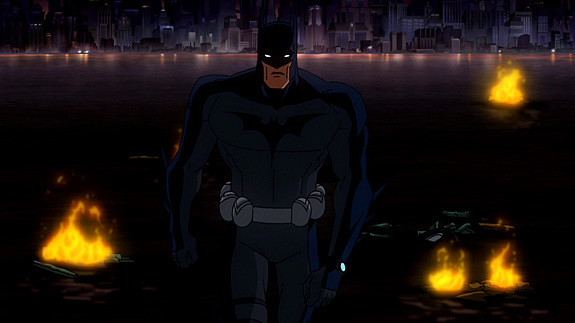 The animation, backdrops, and characters are just above that of Public Enemy and much darker; the attention to detail is amazingly high, and I especially enjoyed the look of Batman, with the full-on cape action, giving a dark, regal appearance. To me, if you nail batman's cape, you've nailed the character. Finally the action is very well balanced – not too much to overload the senses, but not too little to bore you, and very well spaced out. Prime example is the fight between Barda and Wonder Woman versus the Furies, which is just balls-out awesome! I did say this is a near perfect translation. I for one miss the connection and narratives between Superman and Batman as the two speak of one another's strengths and weaknesses and why they're such good friends. That narrative helped carry the comic and I think it would have carried the film equally. I also would have liked the opening from the comic to have kept rather than the voice of the radio announcer. In the comic Batman and Superman have a funny back and forth, with Superman held up in the Batcave wanting to help with the investigation of the mysterious ship. Finally I'm not a fan of the voice of Darkseid. I really wanted my sub-woofers to rock whenever he spoke, instead… meh! Even with its minor faults, Superman/Batman: Apocalypse is a satisfying translation of a comic to animated screen that won't disappoint. Look for the DVD and Blu ray to be released September 28th in a single disc or two-disc special editions, with the Blu Ray giving you an added bonus of a digital copy. 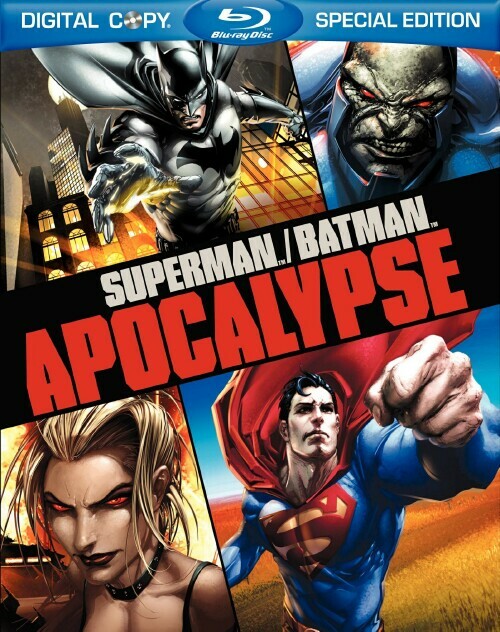 So out of TOV 5 stars, I'm giving Superman/Batman: Apocalypse 4.5 stars.